We survived Christmas in our own home! We opened presents here in the morning (not too early fortunately! ), and then left at about 11:30 for a quick drive to Philadelphia to see my adorable niece who is just 5 months old. It was great to be with them for her first Christmas. Hope you have a wonderful New Years Eve! Stay safe. Take a cab or get a designated driver. We're staying home and having some friends over for a casual dinner of enchiladas and tacos. Blue margaritas seem like a great way to ring in the New Year! Just dropping in before the end of the year to share my winter/Christmas mantel in our Living Room. 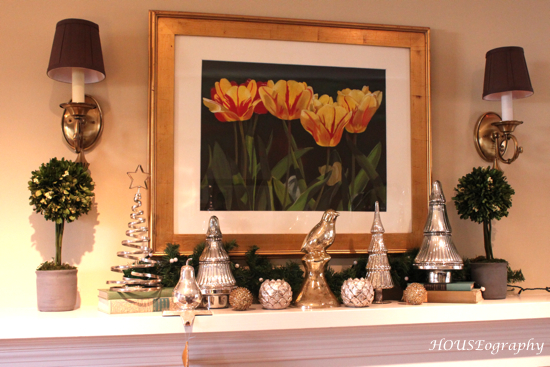 I shared my informal family room mantel decor a few weeks ago but I absolutely love my living room mantel this year which is completely different from its neighbor in the family room. This is a collection of silver and glass trees and other metallic trinkets that I picked up at the after Christmas clearance sale at TJ Maxx last year with my mom. I picked up those topiaries at the end of the summer on Target clearance ((Smith & Hawken). I coveted them all summer but couldn't stomach their ridiculous price. In the end I think I got them for $19 each which seems reasonable for something I can use in any season and in a variety of locations. I thought about changing out the picture for a mirror just to amp up the reflectiveness but then I realized that was more work than I was willing to do in this crazy time of year. I wonder if I could leave this set-up for a few more weeks and call it a winter mantel? Any New Years Eve plans? New Years Day plans? How about those Redskins?! !